Banner blindness isn’t a myth. But it doesn’t just apply to banners. People are bombarded by advertising everywhere they go. They aren’t just blind to banner ads. They ignore most every sales message you try to throw at them. It’s one of the reasons you can’t rely on tricks or gimmicks. Just putting up a banner ad and linking it to an existing Web page won’t cut it. You need to create campaigns, not stand-alone ads. And you need to start with three simple rules for clickable banner ads… then apply a little-known strategy that turbo-boosts results. When AT&T placed the first banner ad in 1994, history was made. And started a new form of advertising in the process: banner ads, in combination with a landing page, moving a prospect from interest to exploration to action in as short a time as possible. Today, people don’t need instructions. They know that clicking on an ad will take them to a landing page. But new technology is allowing us to optimize that landing page as never before. It’s not just a digital sales letter anymore. With the onset of tracking links and migrated data, landing pages have become one more touch point in a complete sales funnel. Not the end, but the beginning of an ongoing relationship. It’s called retargeting, and it’s a powerful addition to your conversion optimization toolkit. Instead of creating stand-alone banner ad/landing page combos, you create a campaign that keeps you top of mind—even after visitors have left your landing page. So you can deliver tailored messages to people, based on the ad they clicked on, the page(s) they visited, or the product page(s) they seemed most interested in. We’ll talk more about that in a minute. For now, let’s focus on the basics. It all starts with a banner ad that generates clicks. If your banner ads aren’t converting, they’re probably breaking one of these three rules. Your banner ad should flow seamlessly into your landing page in both design and messaging. The ad should provide as much information as possible without overwhelming the visitor. Focus on providing a strong value proposition that makes people want to click. Most important, ensure the marketing message and value proposition are consistent and clear throughout the entire campaign. The truth is, it isn’t a pretty design that gets people clicking. It’s consistency. You want to make sure your message makes people want to click—that it’s clear and compelling. And you want to keep that message in front of people. In the banner ad… on the landing page… and beyond. The offer/call to action: Just $19 a month. Please Help. The logo on the right. It’s a clean design with plenty of white space around each element, so it’s easy to read. And the core message is enlarged, so you know where to focus your attention. The banner has a somewhat monochromatic design, with white text on black background. This ensures you won’t miss the bright pink button asking for help. Click, and you’ll see how well it integrates with the landing page. There’s no extraneous messaging here. The banner told you why you should help. 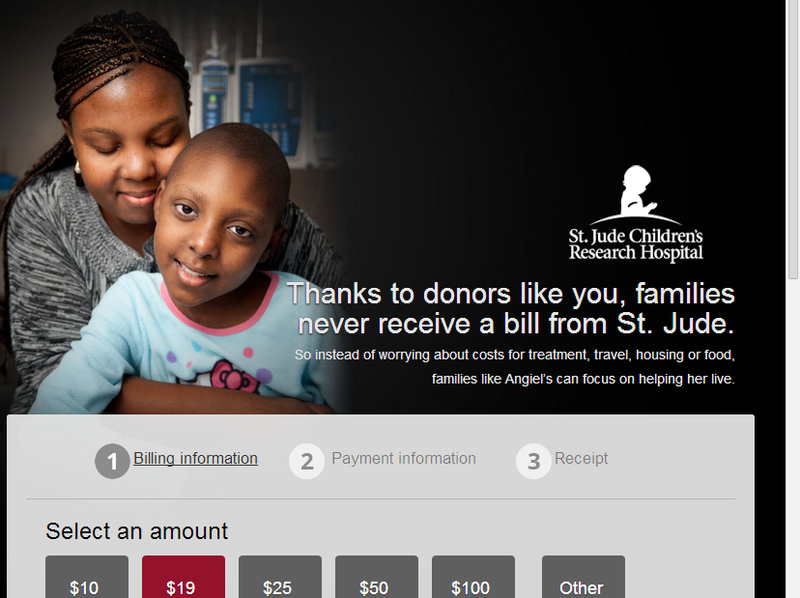 On the landing page, St. Jude assumes you’re serious about your desire to help and gets right down to business. Notice the color scheme is still black with white text. Generally, it’s recommended that you don’t use a reverse color scheme like this, since it’s easier to read dark text on a light background. But here it works. The black background is simply that—a background for the gray box where you’re asked to select your donation amount. Notice the preselected box is $19, the amount that was asked for on the banner ad. 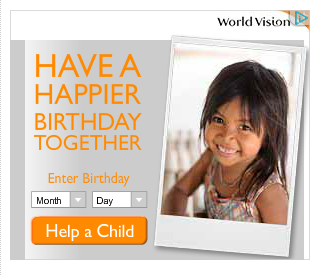 Also, it’s the same mother/child, except that here, she’s looking directly into your face, as if to say thanks. It’s these details that make the ad flow seamlessly to landing page. No interruption. No surprises that make you have to reorient yourself. As a result, it works. This eye-catching banner offers an attractive offer: Make more by working less. It also offers $100 of bonuses for just one cent. You have to admit, it’s hard to resist clicking on an offer like that. The design is clean without being boring. The headline (which is also the book title) is in reverse type (white on dark background), but the value proposition is in dark text on a white background. It’s easy to see while still providing interest. Notice there’s no direct call to action. In most cases, that would be a huge mistake. But in this case, it works. The design includes a blue button-shaped banner that loudly announces ONE CENT. Placed over the penny as it is, it gives the impression of a call to action. The landing page is long, so I’ve just captured the lead (the introduction). But notice how well it relates to the banner ad. You see the book enlarged. The penny is no longer hidden behind the “button.” And the message begun on the banner ad is continued here. Whereas the ad said you could make more working less. Here, you learn how. 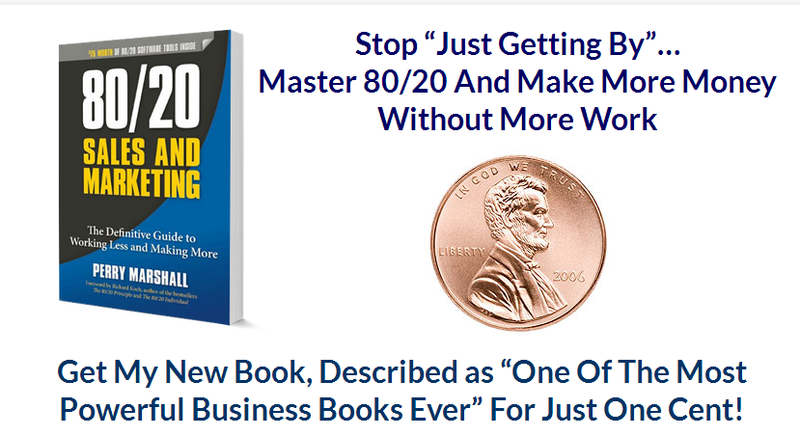 Master 80/20 marketing, and you’ll be able to stop “just getting by.” Brilliant! This page continues with a long-form sales message that answers all your questions and gets you salivating over what you’ll learn in the book. But I wonder if it’s necessary to put so much into the sales copy. The above-the-fold treatment I captured in the screenshot could easily be enough to engage people’s interest with only a little more sales copy. The value proposition is powerful, and for only a penny, it’s a low-stress offer that’s sure to get results. This simple ad is little more than a text ad graphically laid out. The offer is good: 99 cents for a 4-week digital subscription. And the call to action is clear: Try it now. The white text on a dark background goes against the recommended dark-on-light rule. And there are a lot of words in such a small space. What saves it is the clean layout. The words are laid out so the value proposition stands out: “Just 99 cents” and “4 weeks” are enlarged, with everything else reduced. This landing page is beautiful. I love the Apple-esque simplicity of the page. But because the design is so different from the banner, you have to hunt to find the one element tying them together. 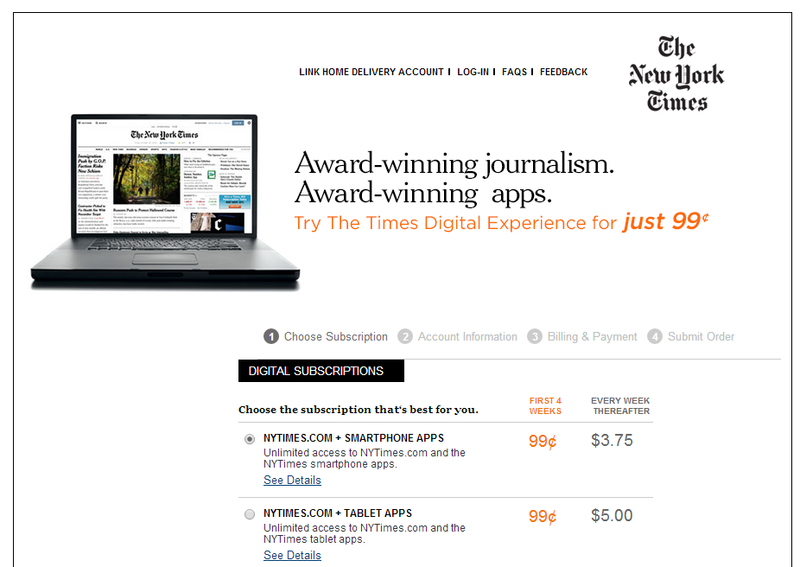 “Try the Times Digital Experience for just 99 cents” is printed in orange in the deck (the line beneath the headline). In the banner, the value proposition was a 99-cent, 4-week subscription. But the real value statement is now shared in the landing page headline: award-winning journalism and award-winning apps. There’s so little congruence between the ad and the landing page, you don’t get the feeling that you’re in the right place when you first arrive. Yes, it only takes a moment to re-orient yourself, but it still reduces the flow. Make the banner’s background orange or the landing page’s deck blue. That at least creates color consistency between the banner and the landing page. Use the same value proposition in the ad and the landing page. Perhaps, Enjoy award-winning journalism for 4 weeks. Just 99¢. Whatever the choice, there should be more flow from banner to landing page. This banner is attractive, relatively easy to read, and compelling. There isn’t an outright offer or value proposition, but by paring “global poverty” in the headline with the image of a beautiful child, you capture most people’s attention. The design is simple. Without cramming too much into a small space, World Vision communicates that you can help overcome world poverty—and impact the life of a child while you’re at it. Given the small amount of information shared, “learn more” is an appropriate call to action. Let’s see how well they deliver with the landing page. Well done, I’d say. 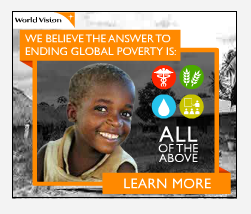 The banner ad suggests that you can help with global poverty. 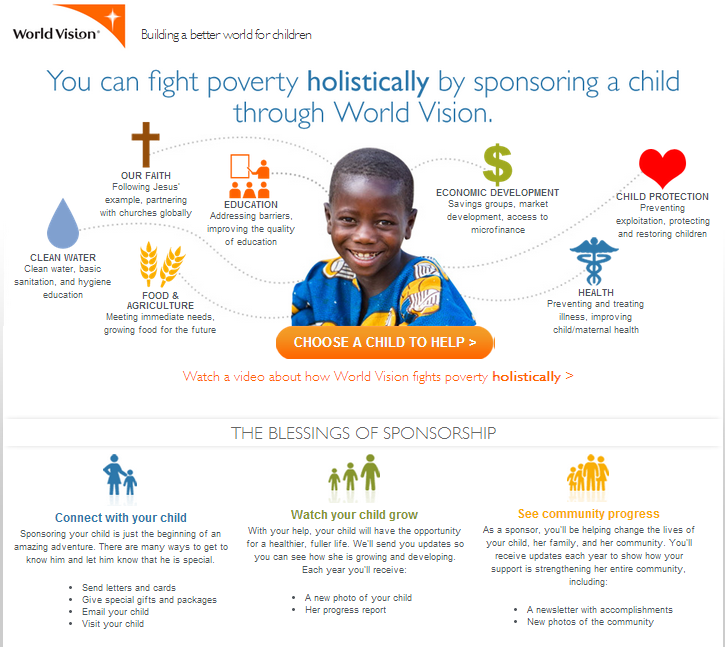 The headline immediately confirms it: You can fight poverty holistically by sponsoring a child. The design of the banner flows very well to the landing page. You get the same orange for the logo and buttons. You see another child who will be impacted by your gift. And the icons (which were hard to read in the ad) are repeated here, with text explaining what they mean. Here also, you see the value proposition. At the bottom of the page, you are shown three “blessings of sponsorship.” For a nonprofit sales page, this offer is specific and appropriate. You can choose the child you want to help and enjoy real connection that lasts over time. As you can see, when you create a seamless flow from banner ad to landing page by giving them similar messaging and design, you create a one-two punch that’s hard to resist, especially if the value proposition and offer are good. But to enjoy real success, go one step further. Set up a retargeting campaign that keeps your brand front and center. Retargeting is a technique for following up with people who visit your website but don’t take action. It’s based on the concept that, if they spent time on your website, they’re likely a good prospect and worth spending a few advertising dollars to reach them. While it could be perceived as pushy, done right, retargeting is a great way to remind people that they have unfinished business on your site. And according to retargeted experts, Dispop, it’s the most effective way to increase campaign results by as much as 12 times for every dollar invested. That’s the “more” I was talking about earlier. Getting your banner ad right is step one. Creating flow with your landing page is step two. Following up with visitors through retargeting is the final step that most marketers aren’t taking advantage of—and the one that can turbo-boost your advertising results. But remember, the real magic comes from a well design campaign. A strong value statement. Consistent messaging. And flow from one piece to the next. How about you? Are you getting good results from banner ads? What’s working for you? Check out other Crazy Egg articles by Kathryn Aragon.